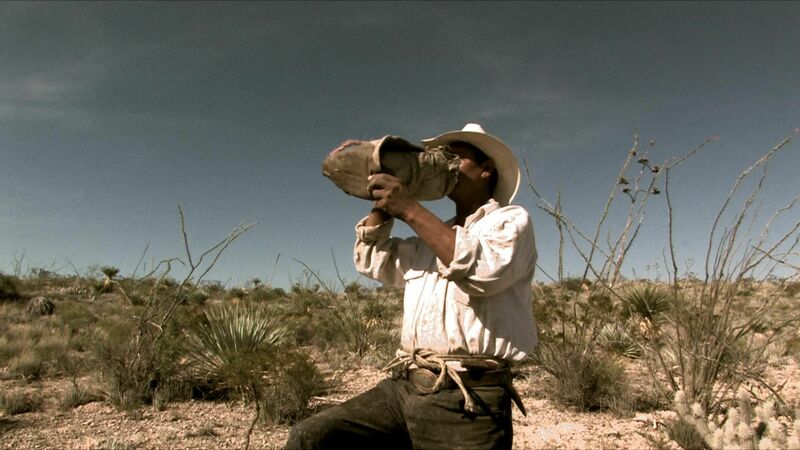 Fixing its gaze on the parched landscapes of rural, northern Mexico and the people who survive the region’s unforgiving climes, Drought is a portrait of a community under siege by forces beyond its control and its attempts to go about the daily stuff of life. Employing largely unobtrusive observational camerawork, spliced with a few interviews with the locals, Everado González’s documentary brings to the screen both an eye for stark beauty in desolation and a sympathetic look at the citizens of the communal town of Cuates de Australia. Plagued by the titular affliction, the town relies on a single reservoir which keeps diminishing in supply, even as the water becomes increasingly non-potable due to mineral concentrations. González takes us through the process by which locals supply the town with water, letting us watch as citizens drive up in a pickup truck and load the stuff into a massive canister to take back home. He also, by focusing his attention on a handful of individuals, paints the drought in more human terms, never more poignantly than when a doctor informs a pregnant local woman that her fetus is malnourished, while her husband looks on resignedly. Eventually, the townspeople pack up for their annual pilgrimage to search for new sources of water and González’s camera lingers on for a moment, taking in the empty shacks and buildings of the ghost town. Although the journey comprises only a small part of the film’s running time, the director captures the twin terrors of heat and uncertainty that attend the trek, lensing the dusty landscape littered with animal carcasses and skeletons and contributing some terrifying night photography as dimly lit figures react to ominous animal noises in the distance. While González structures his film around the life cycles of the townspeople, he does occasionally take too great a liberty in falling back on some rather obvious thematic juxtapositions. Thus a glimpse of two horses copulating gives way to a pregnant woman receiving an ultrasound. Later, when that woman gives birth, the director crosscuts between the scenes of labor and the eventual arrival of the rains, too neatly signaling a literal and symbolic rebirth. But, mostly, González lets his material dictate the progression of his film and, while his hand is obviously felt in his selection of the locals on which he chooses to focus, the project feels as much about the men, women, and children he’s profiling than about his own directorial ambitions. He’s not above capturing some striking landscape shots, seemingly for the sheer desolate prettiness of it, but they always double as a reminder of the very real plight facing the subjects, actual people living in impoverished circumstances which González has the good sense to treat as such.